Imperial Island 4 is rated 2.2 out of 5 by 60. Rated 3 out of 5 by jlroeder from I'm stuck on level 42 Ok, there is a relaxed mode which I've been playing from the beginning. I'm up to level 42 but it won't let me go any further. I've gotten 3 stars, redone the level 4 times and I can't get past it. It says I have to 'get help from the locals' but it's locked and says 'Finish level 42'. Now what? I'm so disappointed in this game. It's kind of boring, won't let you build, it does it itself. Not up to the standards of the others before this one. Rated 3 out of 5 by Starsmark from Nothing like Imperial Island 3 I loved playing Imperial Island 3 but this one is so different I hardly recognize it. I do not like the changes. There IS a Relaxed Mode, despite the other reviews who say there's not one. I've played through the trial but I don't think I'll buy the game. Rated 3 out of 5 by compcrzy from Not as fun This one missed the boat entirely. It's not even close to Imperial Island 3 which I love and play constantly. I'm not sure why the devs deviated so much from a formula that worked. I am very disappointed in this game. Rated 3 out of 5 by karenmusik from No skill options = No buy I would have bought this game (okay, used a free game credit) if there had been different skill levels. I can play with a timer or limited moves, but I don't always want to. I game to escape stress. There are some fun elements, but not enough to add it to my library. Rated 3 out of 5 by mysam from Match three that was stiff I played this on free trial and I am glad that I did not buy it. The play is stiff, slow and not fluid. It takes some time to make a match, I like a game that moves a faster than this one. Plus I could find no way to get the editorial off, after a while was really annoying. I would not recommend this game at all. Rated 3 out of 5 by pennmom36 from WHY DID IMPERIAL ISLAND STRAY SO FAR OFF COURSE? I have always loved Imperial Island Match 3 games but this one is vastly different and not in a good way. It's as if this were originally a f2p mobile game converted to a desktop version with very animated cartoon graphics. They have abandoned all the features that made Imperial Island unique such as loading up the locomotive at the bottom of the screen. There are 120 Levels, 15 Trophy awards to earn (you must "claim" your reward by going into the Trophy section after earning an achievement.) and Collectible Cards to earn in 3 Categories, Obstacles: as you progress you will encounter Obstacles that block you from continuing to the next level such as a Mummy. You are required to replay a specific level or levels to collect items such as Keys (drop them off of the bottom) You will also unlock Character Cards as you help various Characters as well as Cards for each Building constructed. Although this is a colorful game, it's exactly like all the other Limited Moves Match 3 games that have been released lately, where you choose a bonus to start each level, with the same goals of collecting a specific number of specific tiles. The tiles are large and very cartoonish looking, and it's so easy to make large matches that you're constantly acquiring bonuses on the board which makes it seem like the game is playing itself! Just like the other frequently released Match 3 games, it takes forever for all of the extra moves to be played through at the end of each level. Before the start of each level, you are given the opportunity to use Bonuses such as Combo Bonuses, Balloons which create bonuses when matched with at least 2 other tiles of the same color, or a Pusher to force tiles to drop downward. There are also bonuses to use at your discretion such as a Grenade to destroy all tiles of the same kind, a Hammer to take out a single tile, or a Volcano to remove 5 random tiles. Large Matches will earn Bonuses on the board and must be included in a Match to detonate such as, a four tile Square gives you a Balloon to create a random bonus, a Match 4 in a row gives you a horizontal or vertical Line destroyer (depending on which direction the match was made originally) a Match 5 in a T or L shape gives you a Bomb, a Match 5 in a row gives you Lightning to destroy several same color tiles, a Match 6 gives you a Barrel of Paint which puts Balloons of various colors on the board. You can also swap 2 Bonuses that are next to each other to create a bigger explosion. 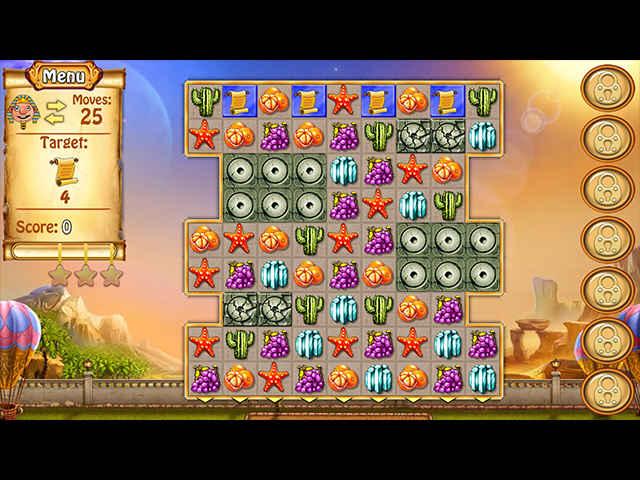 There are the usual Obstructions (not including the Level Blocker Quest Obstacles) such as Gold and Silver Tiles, Stone & Double Stone Blocks, Chains & Double Chains, and one that I did find to be rather creative, Growing Cacti by making matches next to the planter tile, and was the only way to get cactus tiles on the board required as the level goal. 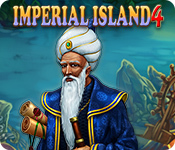 IMPERIAL ISLAND SERIES LIST Title***Release Date***Average Rating 1-Birth of an Empire (August 20-2013) 4.5 2-The Search For New Land (August 20-2014) 3.4 3-Imperial Island 3 (February 15-2016) 4.3 4-Imperial Island 4 (October 8-2018) n/a by: Quick Click Games Inc. Rated 3 out of 5 by calabashbb from More like Mutiny Bay I've always enjoyed a good Match 3 that didn't interrupt with a built in tutorial. I don't use music or sfx to gauge the game quality. I was going to use a free game code, but I think I'll hold on to it and pass this one. Rated 2 out of 5 by splash1234 from Not as fun as the other ones Not much to say because I do not like games with limited moves. Rated 2 out of 5 by Katrikki from Imperial Island 4 Annoyingly too little time to complete levels. I like games that are not too easy but this is just too hard, not pleasant anymore. Rated 2 out of 5 by lbtgam222 from liked the others ...this one not so much I hit high score against the "BOTS" but still got one star. Not sure why. Rewards are slow, I'm just not into this game. No purchase for me, even with a free game credit. Rated 2 out of 5 by Wendylyn from Imperial Island I have loved the other Imperial Island games and have played them over and over again. This game is a disappointment. I wish I didn't buy it. The icons are nice, but the play isn't up to standard of the other Imperial Island games. I don't like that you are limited in moves and that we can't buy buildings like we could in the past. VERY DISAPPOINTED! Rated 2 out of 5 by verimeri from disappointing I loved the first three Imperial Island games but this one is not good at all. First of all it is a limited move game. There are no other choices at all. If it had a relaxed choice I maybe would have continued. By level 15 I could see that limited moves would be a major problem. The only way to get more moves is to buy spins but you get very little gold to buy them with. The graphics are cartoonish. The tutorial seems to go on forever. Just not a buy for me. Rated 2 out of 5 by matouks from why? I haven't had a chance to play BF for 5 days so was really excited to see Imperial 4. I've lost count of the number of times I've played game 3. Why do designers feel the need to change the game when the last game (game 3) got 4-1/4 stars, & fantastic reviews. Imperial 4 is a kids game - period. Altho all ages can play Game 3 it is an adult game. Fast paced, earn bonuses and keys to unlock cabinet with bonuses. Screen of bare island to start and then watch as island becomes a metropolis of bldgs, ships, & trains that you fill up with resources. Not only are there wood and stone blocks to crush, single and layered silver and gold blocks, chained resources but you might trigger an ice block or sand block. THEN there are the multiplying crabs and octopus' that will take over the entire board if you don't make matches next to them. Hidden parts of the game are triggered and chests or cargo cars must be dropped off the board. The game becomes more challenging as you go along. The graphics are wonderful, good colour, screen constantly changing and main screen with island makes you want to watch the movement as island grows. There are more features than I have listed but one can see how this is a grown up, practically perfect no need to change it kind of game. Just add a new feature, tweek what is there and give us the match threes that we wait for in great anticipation. . Rated 2 out of 5 by wyebank from Such a disappointment As most of the other reviewers have stated what has happened to this game. I love, love , love the other 3 games in the series and was thrilled to see number 4. Oh dear not good. I own all other 3 games and had to download them from my purchase history just to make sure how good they were. Number 4 is nothing like and is very boring. Spoilt my week. Rated 2 out of 5 by alfiebiggins59 from How disappointing Being a huge fan of imperial Island and having purchased the previous 3 games in this series, I was really excited when I discovered the release of the next chapter. What a huge let down! What was once a winning formula has been changed to fit in with all the other 'humdrum' match 3 games, nothing special here folks! A very annoying tutorial, that pops up at the start of levels, poor graphics, poor gameplay, and my pet hate, limited moves!! Really disappointing guys .... why did they change a winning formula? Rated 2 out of 5 by tacomataz from I tried to like it. I really tried to like this game but I could not bring myself to it. I love the other games in this series but this one is a dud in my opinion. I just can not put in to words why I disliked this one but I just don't. Rated 2 out of 5 by nelliebj from Really? I have played all of these but this one just left me cold. Even the first few levels drove me nuts with having to have instructions and it was never a move I would have made. But you are forced to do just that. And then it wouldn't. The game froze, then it was ok but it would not let me make my own moves, just the ones it said. So no. I don't do that. This is the fourth in the series. If you played the first three, you would have figured it out. And come on, it's a Match 3. Not a lot of brain work involved. Loved the first three. This one, no. Rated 2 out of 5 by Raewynk from Not Good I have all the other Imperial Island games and have enjoyed them. This is a terrible game. I only played 3 levels and that was enough for me. 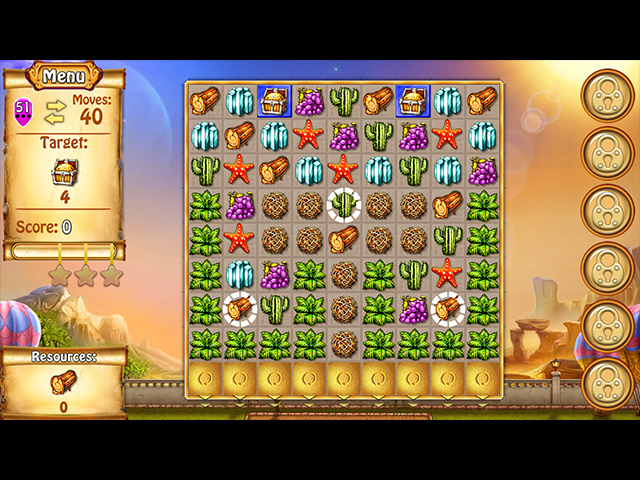 I play match 3 for pleasure not to try and beat the clock or to beat limited moves. Bad mistake on the part of the developer to not give the player options for changing this. Rated 2 out of 5 by brimaz from WHAT A DISAPPOINTMENT!! The Imperial Island series has been one of my favourites for quite a while, and I play the three games over and over. But this one - truly horrible! It's absolutely nothing like the previous games, and all differences are most certainly not improvements. I will definitely not be buying this game. Rated 2 out of 5 by helpqueen from Do Not Recommend I will not be purchasing this version of Imperial Island. It is not at all like the previous versions which I enjoyed very much. It's just like every other match 3 game released recently. They must all be made by the same developers. Bad form. I enjoy match 3 games so when you have a winning/selling series leave it alone! Rated 2 out of 5 by Calopsitta from Just everything I do not like packed together! The game works just fine, and has also a good number of new ideas. You will find minigames on the map that will help destroying obstacles (the first of them being a zombielike mummy), pharaos eager to lend a hand in exchange for money, Cleopatra willing to exchange money for resources and so on... all very funny, cute and in bright colors. My only complaint, and it is a matter of personal taste, is that the only difficulty you find in otherwise very easy m3 schemes, is that they are limited time and limited moves. There is no option to change either thing, but beating each and every level is imperative, or you will find your way to the next level blocked very soon, if you do not acquire all the prizes granted for completing the scheme in the shortest time possible. By the end of trial time I was already beyond frustrated.... but give it a try if you do not mind limited time and moves, because it looks like a very good game overall. Rated 1 out of 5 by Thunderhorse1 from Different. I'm not sure why people are saying there is no Relaxed mode - there is, I've been playing relaxed mode from the start, all you have to do is check the little "Relaxed" box that appears on the screen. Having said that, it's definitely not up to the standard of the other Imperial Island series, quite childish icons, takes time loading each level and you often have to click buttons twice to make anything happen. I will finish the trial but won't be buying this one. Rated 1 out of 5 by angy4451 from Oh no! I too loved #3,so this was very disappointing. I'm a pretty good Match 3 player, but this was just confusing! 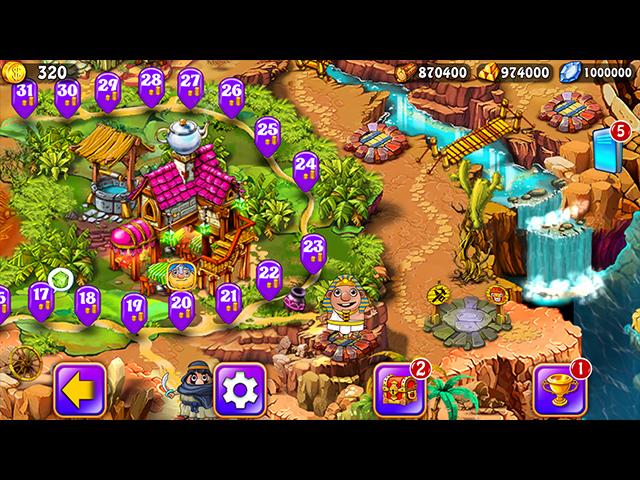 Rated 1 out of 5 by emmajane13 from Imperial Island what happen! the other games were great! this one was bad!! Rated 1 out of 5 by caircair from Exactly the same as every other game by this developer I've seen other games by this developer, and they all play the same. Match-3 with limited time and moves, you need to play each level 3 times to get all the coins, minigames to get more resources but no real plot or development to the game itself. BORING, BORING, BORING! I loved the other 3 Imperial Island games, but this is a HUGE disappointment. I won't be buying this game. Rated 1 out of 5 by Atums from Sub-par I enjoyed the gameplay and graphics on the 3 previous games in the series, especially numbers 1 & 3. This new one was horrible! There are constant interruptions, the graphics and storyline were on a children's level. I played for 5 levels and couldn't stand the tedium any longer so I deleted it. I do not recommend this game.